"Skipper's Challenge is a great idea, imaginatively conceived and brilliantly executed. Besides its obvious educational value, it ought to provide hours of fun and games in the cockpit. It should enjoy a huge success!" Are You As Seaworthy As Your Boat? Take the "Nauti-Bender" 900 And Then... Sea! 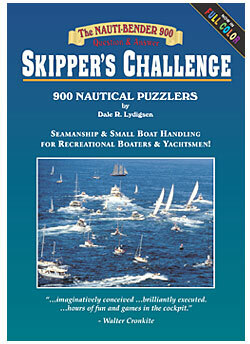 900 "Nauti-Bender" Puzzlers... to challenge your seamanship and boat handling skills... what every serious skipper should know. Written Especially for Recreational Boaters ... who want and need the practical, day-to-day seamanship knowledge and skills required to safely enjoy their favorite pastime. Whether Into Power or Sail... this full-color (900 photos/graphics) book offers an enjoyable learning opportunity for the novice while presenting a comprehensive review for even the most experienced skipper. Each Page Will Challenge Your Nautical Skills... posing basic to in-depth questions with descriptive graphics on boat handling, docking navigation and other seamanship concepts needed while on-the-water. "Any day on-the-water is a good day!"